You spent hours on researching a keyword then another few hours on writing a great blog post and promoting it via social media sites, finally you work on getting back links to it. You do all this just so you can make it to the first page of Google. After a few days your article starts to climb Google SERP and you finally make it into the top 3 and traffic starts to flow. You are ecstatic and very pleased with Google. 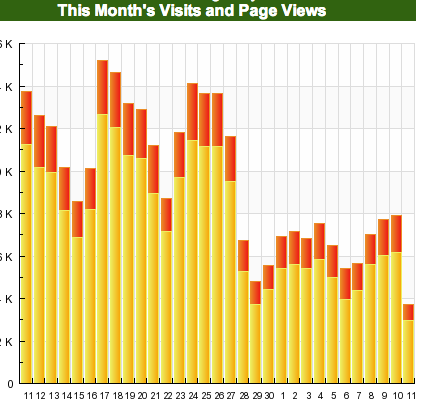 A few months later you wake up and traffic has dropped about 50%…WTF? You immediately start checking your analytics and SERP rankings and find out Google has decided that your content is no good and dropped you to the second or third page. WTF! Google is a f*(#*@! Almost every blogger can relate to this scenario, myself included. In April 2012 some of my pages dropped in ranking on Google and took traffic down by about 50%, late in September 2012 it happened again and traffic dropped about 50% again. It is natural to have a little bit of a panic attack when you first realize what has happened, however you need to snap out of it and get back to work because nobody cares about your whining. Yea I know, it’s not fair that some crappy content is outranking you, but then again life is not fair. So complaining and bitching about Google’s algorithm isn’t going to help you, but what will get you back up is continuing to publish great content, of course I am assuming your content is great which maybe an incorrect assumption. The fact is that nobody outside of Google really knows much about the algorithm and updates. Although there are people who make educated guesses, they are guesses. Don’t waste time trying to outsmart Google, or figure out how they rank sites. Your time is way too valuable for that kind of crap, spend your time on what you do best, publish great content and connect with readers through social media. Besides publishing posts on your blog I highly recommend you make it a regular habit to publish guest posts on other blogs. You will not only reach a new audience that may not be aware of your blog and some might even subscribe, but you can also get valuable back links from the blog. Maybe even make a new friend in the process. Another thing you should do is go back to your old articles and update things a little. Sometimes bloggers tend to over optimize articles, Google has warned a few times about over optimization. Make sure you have a good meta description and title. Just don’t go back and stuff it with keywords and phrases. Post it again on your Facebook page, Google+ page and tweet about it, maybe write a new article and link to it again. You can also ask a few of your blogger friends if they can link to a certain article on your blog in an upcoming post, often people don’t have an issue with it. Will this get back your old ranking? Maybe, maybe not. There is no way knowing for sure, but it sure beats being bitter and passive. Remember search engine ranking is a zero-sum game, there were 10 links on the first page last month, there are 10 links today and there will be 10 links tomorrow. For every site that falls off the first page a new site comes in. There will always be as many happy people as there will be bitter people. I was just reading how a good number of keywords are now showing 7 results instead of seven. This would have a huge affect on traffic if you had keywords in that 8-10 spot. So maybe there won’t be 10 links on the first page tomorrow :). But yes it can have a significant affect 8-10 spot. I haven’t had the problem of overall traffic decreasing across the board, but a few keywords that I rank well for will just fall off the map sometimes. Usually it comes back after a few weeks, so it’s best not to sweat it too much. Or, if it’s a specific keyword that dropped, try writing a new related article and link back to your original post to ‘refresh’ it for Google. Guest posting with the same strategy in mind should help as well. Hopefully your rankings return soon!